One of the most whimsical “vehicles” in the world is the unicycle. It’s also one of the most challenging ways to get around. But at the appropriately named grade school, “Uni” Hill, a circus club teaches children to ride the uni-cycle. Casey Middle School 7th grade Sophia is a graduate of the Uni Hill Circus Club. Here’s her report. Thanks to Casey Journalism teacher Lee Lazar for her collaboration on this project. This program was made possible in part through a grant from the City of Boulder Youth Opportunities Board. This program broadcast on KGNU on Friday, May 27th, 2011. NARR: My name is Sophia. I’m a 7th grader at Casey Middle School in Boulder. The first time I I really wanted to ride a unicycle was when my older sister Emily learned how to do it, when she was in the first grade. EMILY: It was one of the really first sports that I got into. I was not a very athletic small child. So it was something that I could do. You know? That’s what it meant to me. Da-dah! 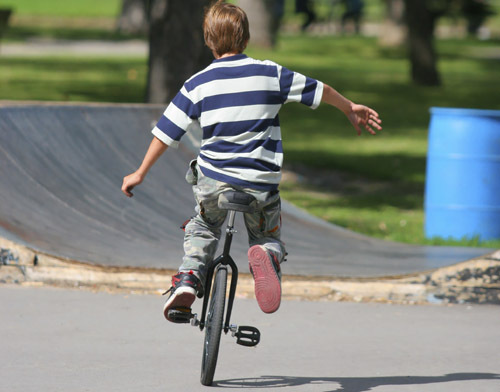 NARR: The first time I rode a unicycle, I was six years old. I could ride a unicycle before I could ride a bicycle. This part is embarrassing, but my mom says, pretty soon, I was teaching my friends to do it, too. MOM: I remember holding your hand, as you unicycled along. I remember sometimes I’d hold somebody else’s hand, who was on a unicycle, cause they couldn’t unicycle very well, but you could unicycle. SOPHIA: Please take that smile off your face! MOM: You’d hold their other hand, and you’d unicycle, and I’d walk other hand, and together, we’d help them unicycle. NARR: I learned how to do all this when I was at University Hill Elementary School. They have at after school Circus Club there, and my unicycling buddies and I were there a lot. 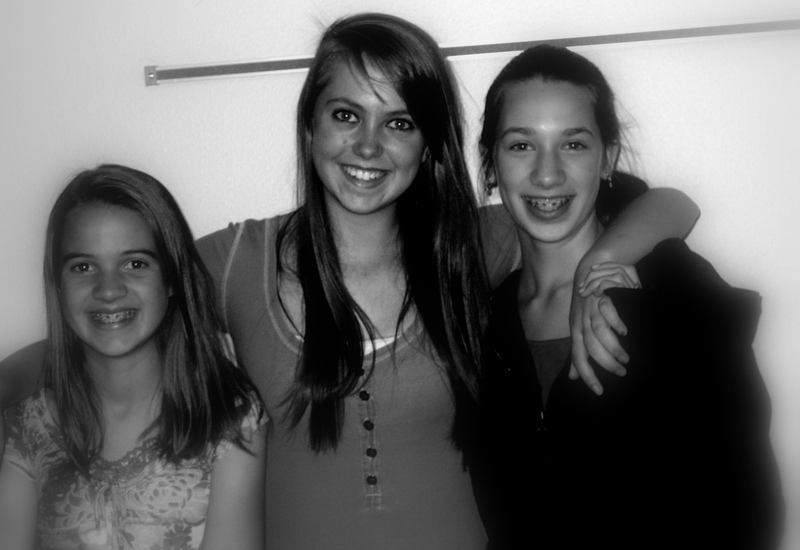 We’re all 7th graders at Casey now, and we hadn’t seen Circus Club for two years. So one day, three of us got on the RTD bus and we went back the Circus Club. NARR: On the way to Circus Club my friend Carley told us about her NEW unicycle. CARLEY: I’m getting a new unicycle tomorrow. SOPHIA: Are you replacing the little tiny wheel? CARLEY: Yes, because the wheel that I have right now is teensy tiney, and I’ve fallen twice because of that. So I need to upgrade. NARR: My friend Annie told us about her favorite unicycle show when we were in the Circus Club. ANNIE: When we performed in the talent show and we all five went around in our little pinwheel circle thing. SOPHIA: The five-way pinwheel? What was your favorite trick you guys? CARLEY: Sophia, definitely, the trick that Sophia made up. Yeah. ANNIE: Or the three-way spin thing where we grab hands and then one of us slides off and the other one comes in. NARR: At University Hill Elementary School, we got off the bus and went into the gymnasium where a lot of little kids are at the circus club. Some were practicing on the balance ball. And a few of them were unicycling. MONTAGE: I do unicycle. I kind of dribble while I unicycle sometimes. That’s cool. NARR: It was fun to be there but . . . I used to think this gym was big, and now it looks so small compared to the gym at Casey because, you know, smaller people, and it was kind of a shock because I hadn’t been back in a while. So that part seemed really changed. But the gym teacher seemed the same as ever. His name is Brad Fink. He says that learning how to unicycle helps with lots of sports. BRAD: For me, I’m a mountain biker and a road rider, and so unicycling just increases your ability to balance in different situations on the trail. NARR: We talked with Brad some more and then we practiced some unicycling with the other kids, and then I asked Brad one more question. SOPHIE – What was your most proud, good unicycle moment. BRAD: Oh, my gosh. I would have to say your crew, from two years ago, when they did that crazy routine that was off the hook. NARR: After seeing Circus Club, we went back to Casey, and decided to try and teach two friends who had never unicycled before. MONTAGE: Squeeze yourself forward. Perfect, good job, try that again. So good job. Annabel, hold one hand. Carley, hold the other hand. You’re a really fast learner, Ava! It was good until you fell. Straight limbs. Deep breaths. You got it! Ahhhh! They’re doing better than I thought they would. It’s not cheating to hold someone’s hands because unicycling is really hard. You guys I love this unicycle. NARR: I still love to unicycle, but not everybody keeps it up. Take my sister, Eliza, who is the first person I ever saw riding a unicycle. She says she doesn’t ride much anymore. But she still remembers what it was like to learn. ELIZA: When I hear the word unicycle, I think of the Thanksgiving break, during first grade, when I pretty much, like the unicycling just clicked for me. I was on my unicycle pretty much the entire break. I went from one end of our house to the other. NARR: I don’t think I’ll ever stop unicycling. It’s a truly unique sport, and everyone should try it. For Casey Middle Schoo, and KGNU, I’m Sophia. The American Gut Project – What’s in YOUR Gut? Copyright © 2019 Eat Your Radio. All Rights Reserved. Magazine Premium created by c.bavota.